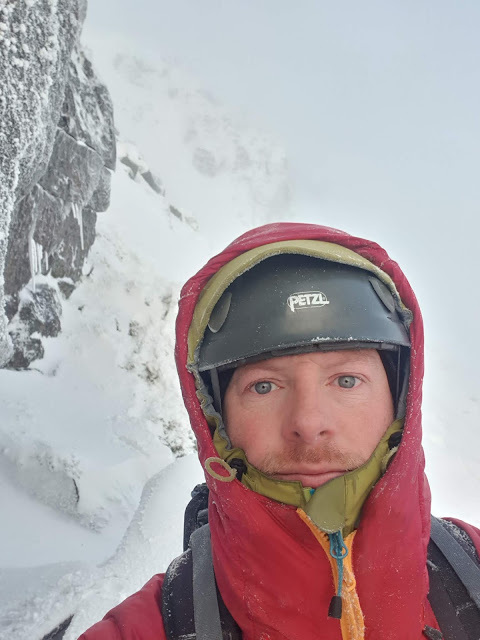 Today I was joined by Stu and we took 2 clients each up the East Ridge of Beinn a Chaorainn (I had a quick solo up it last week to check it out). The weather was stunning, warm, low wind with awesome views and just about everything you could ever ask for from a Scottish Winter Day. 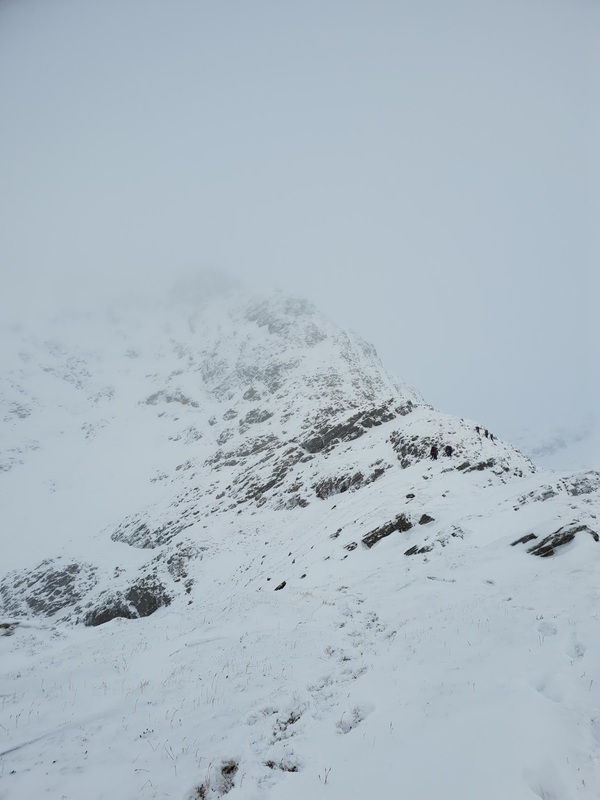 In fact it is worth at least 8 pictures! 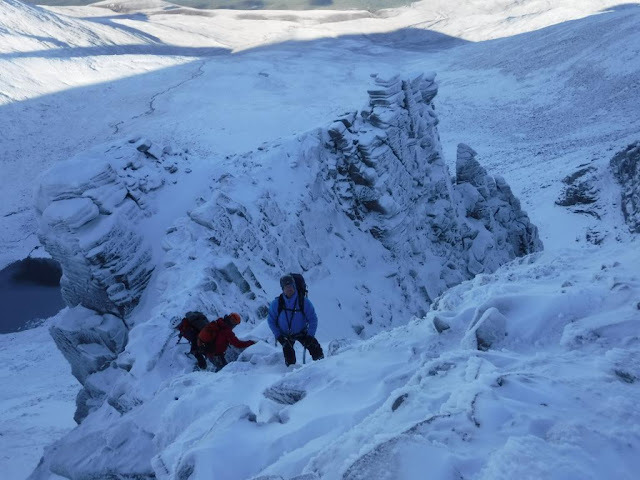 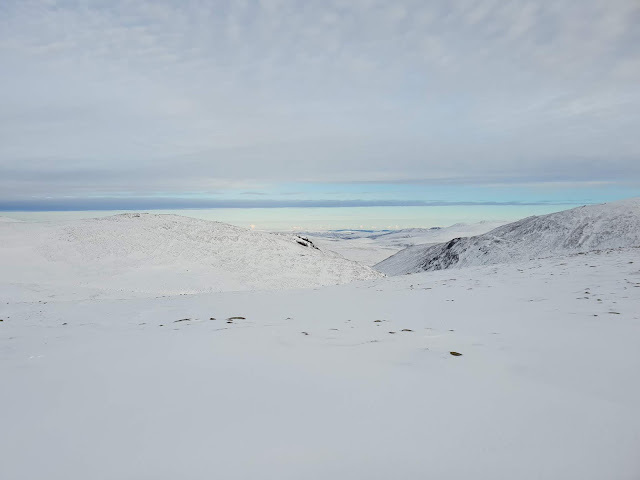 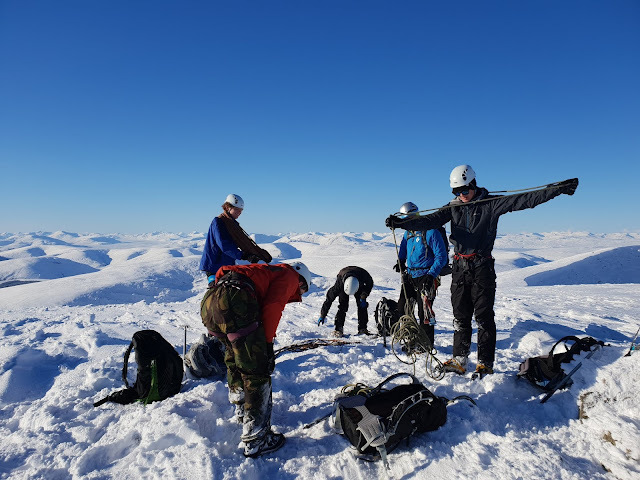 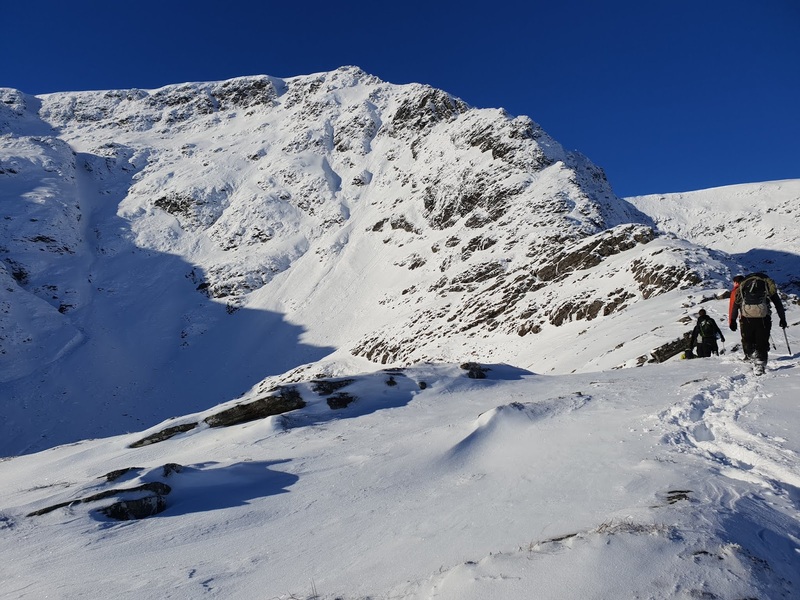 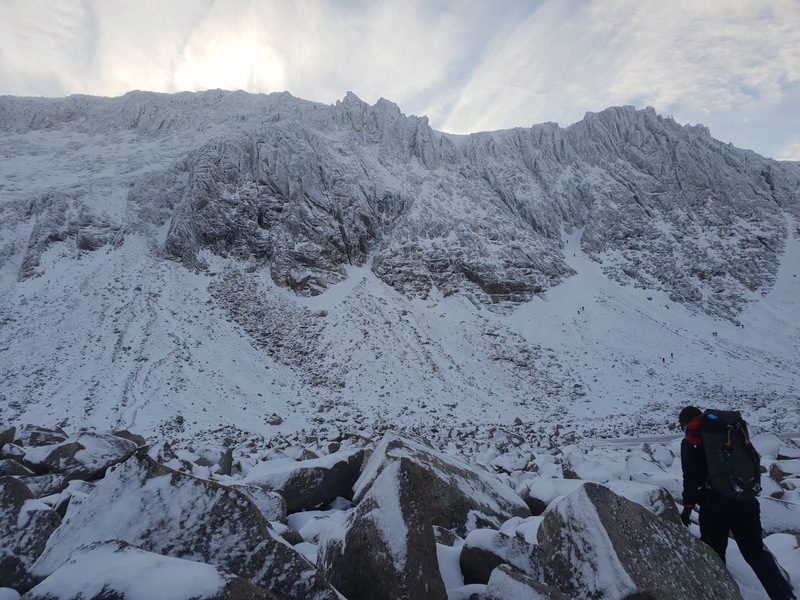 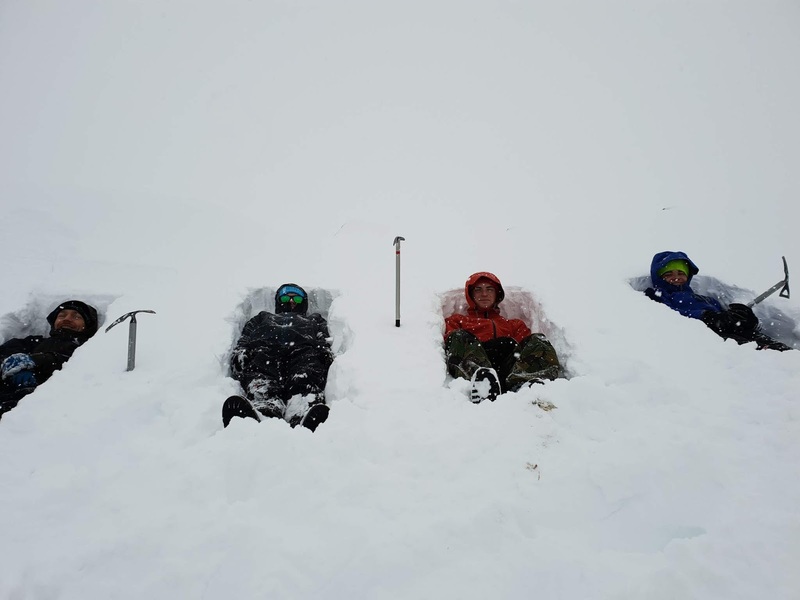 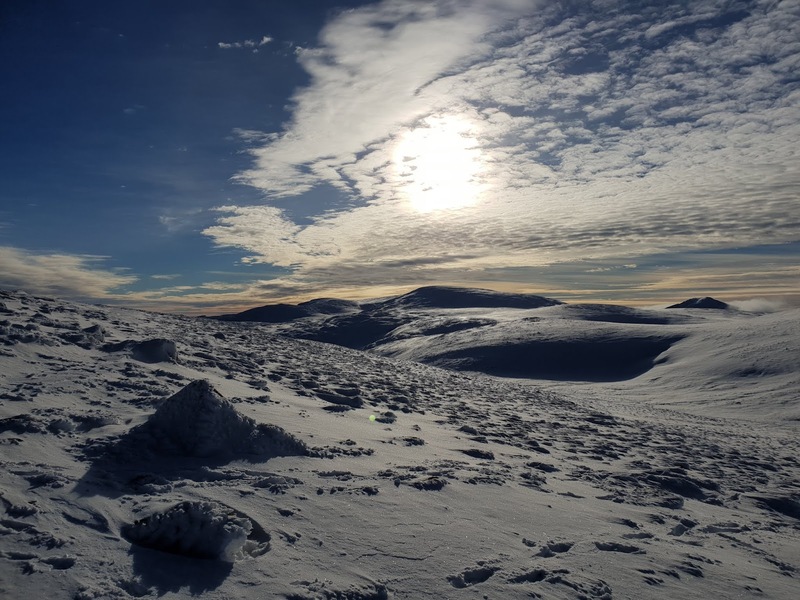 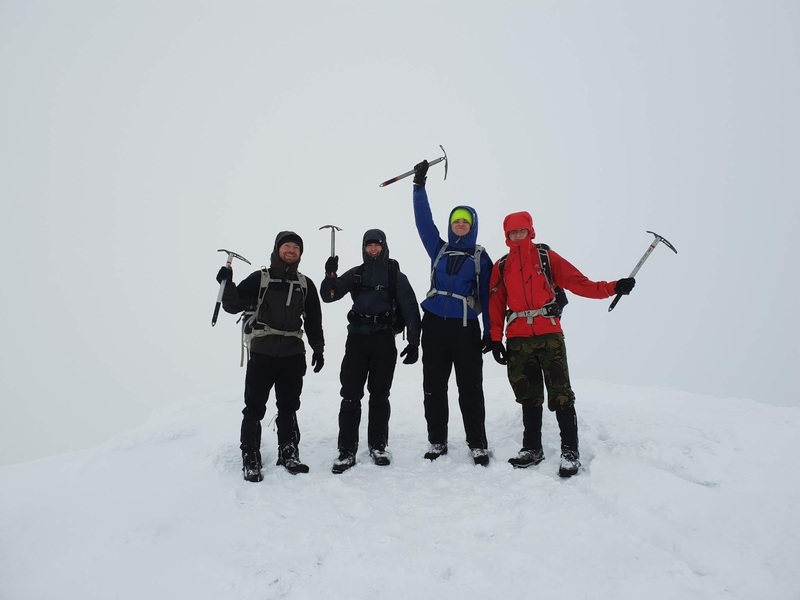 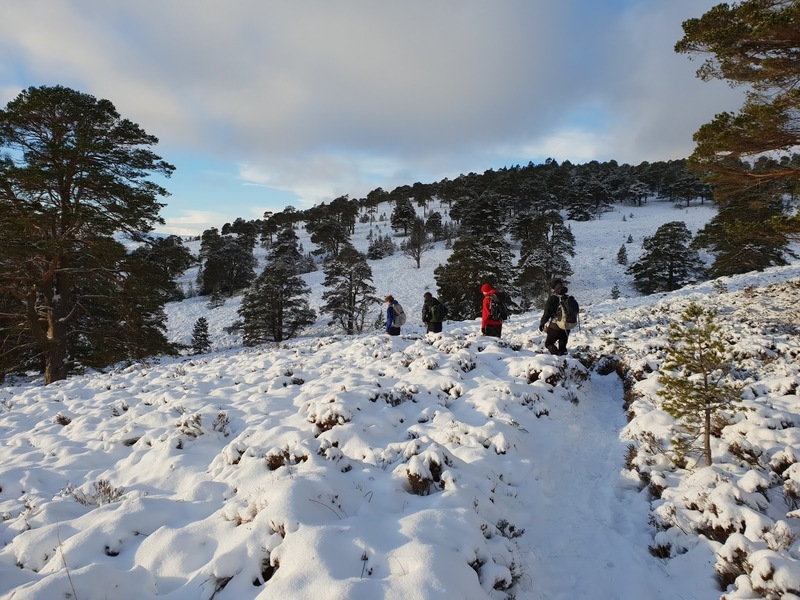 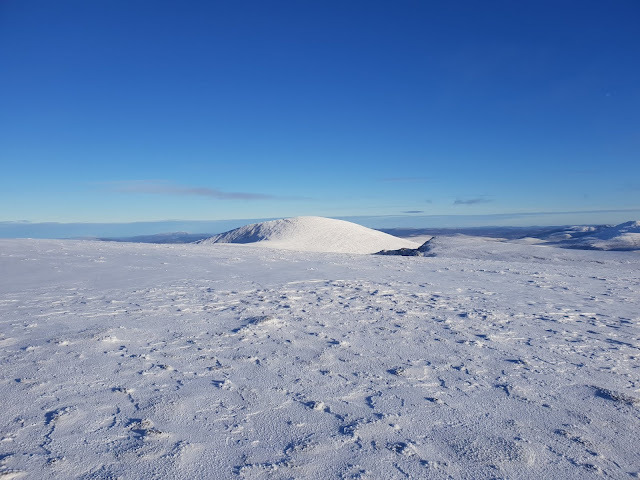 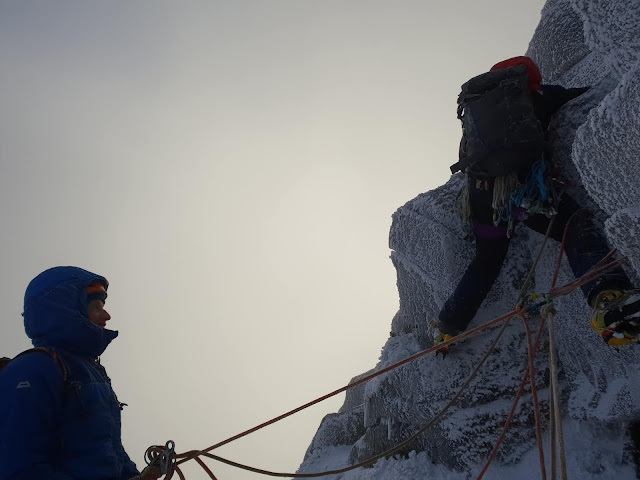 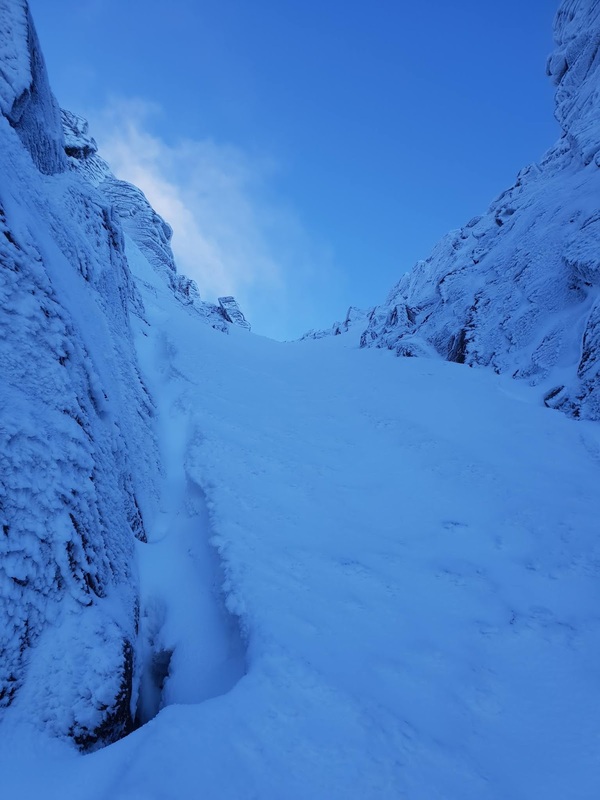 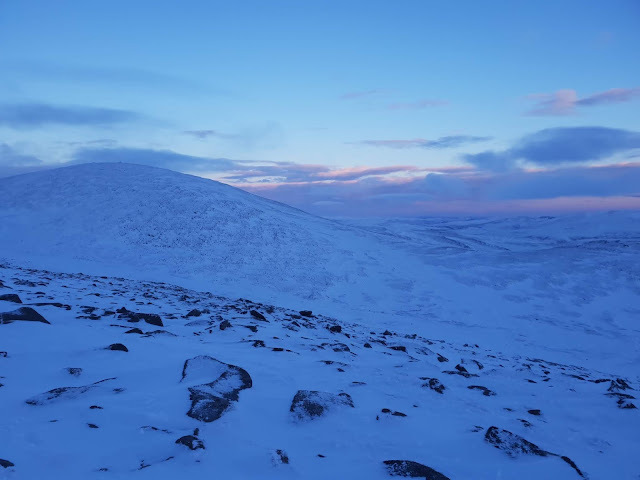 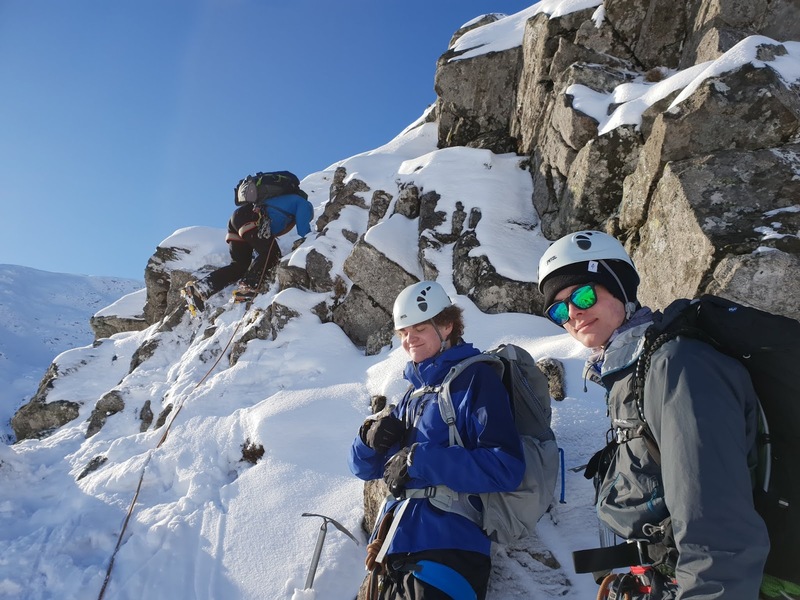 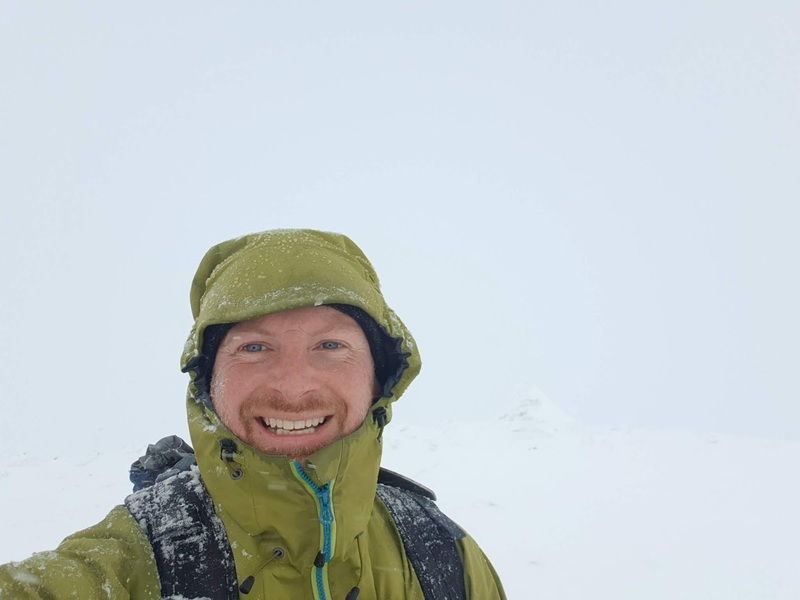 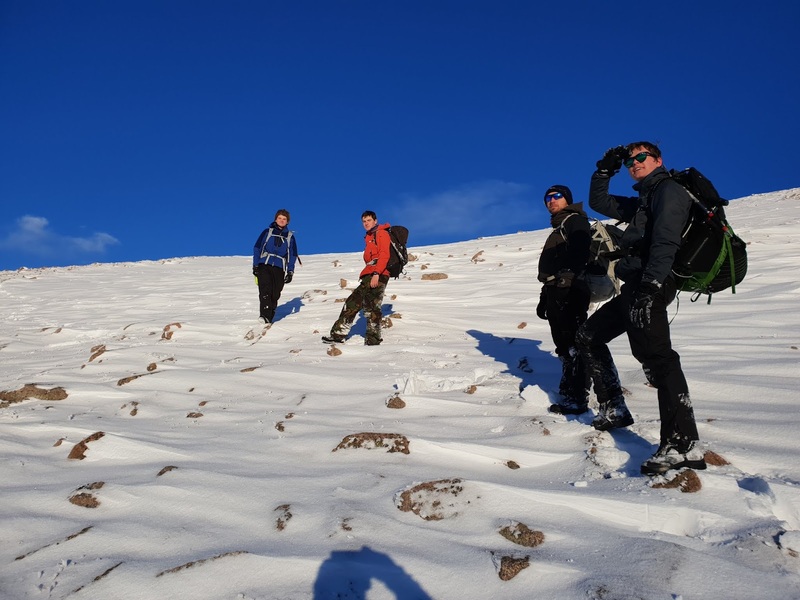 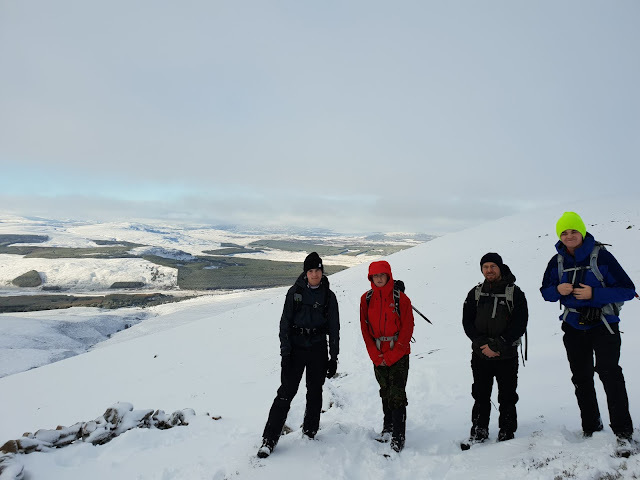 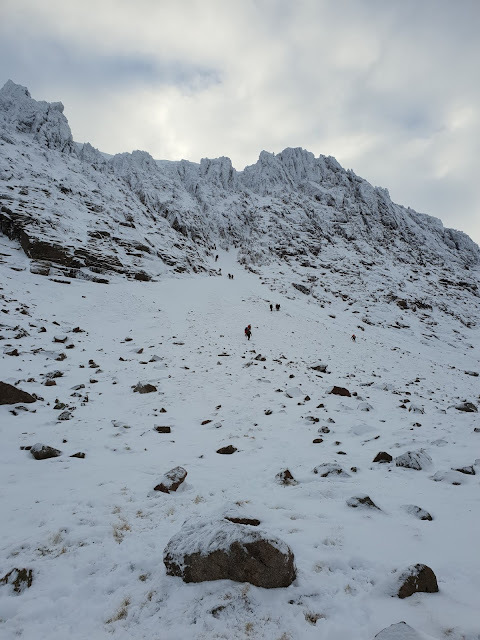 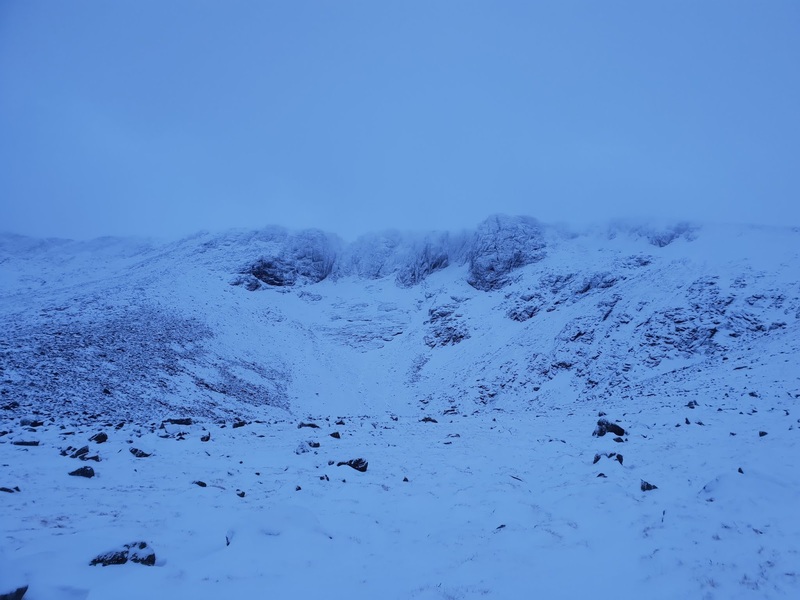 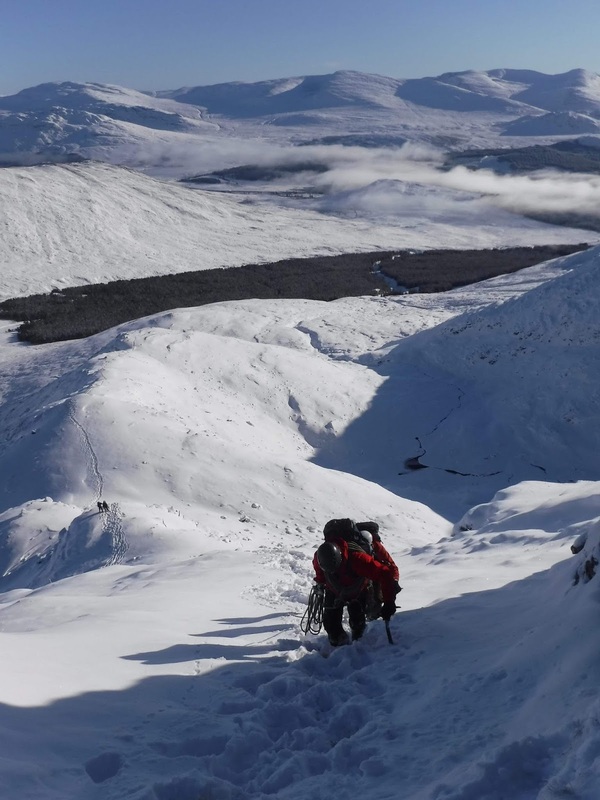 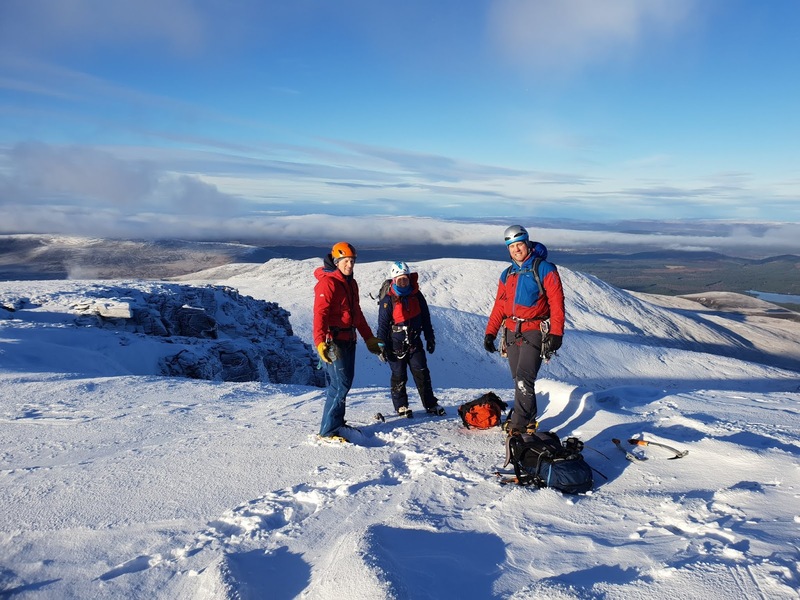 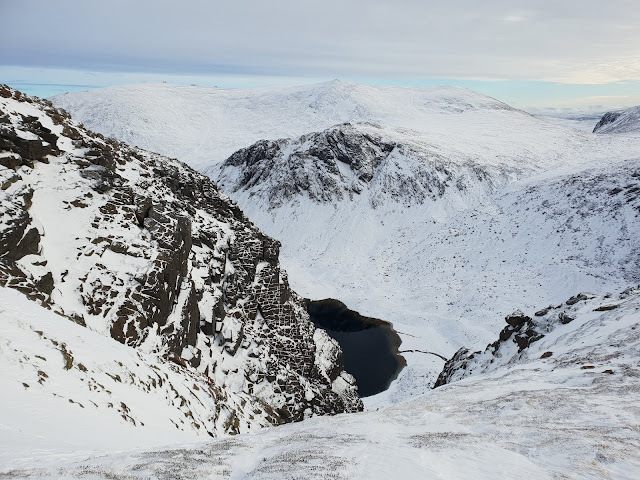 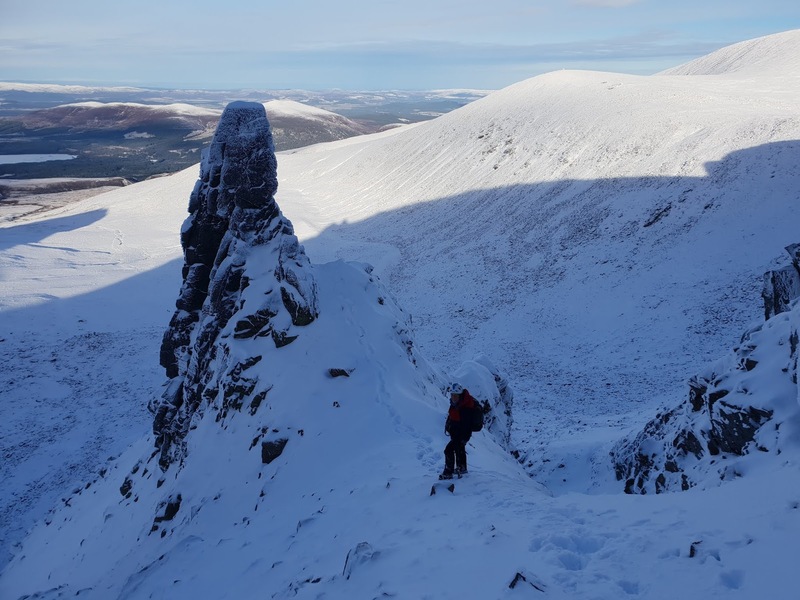 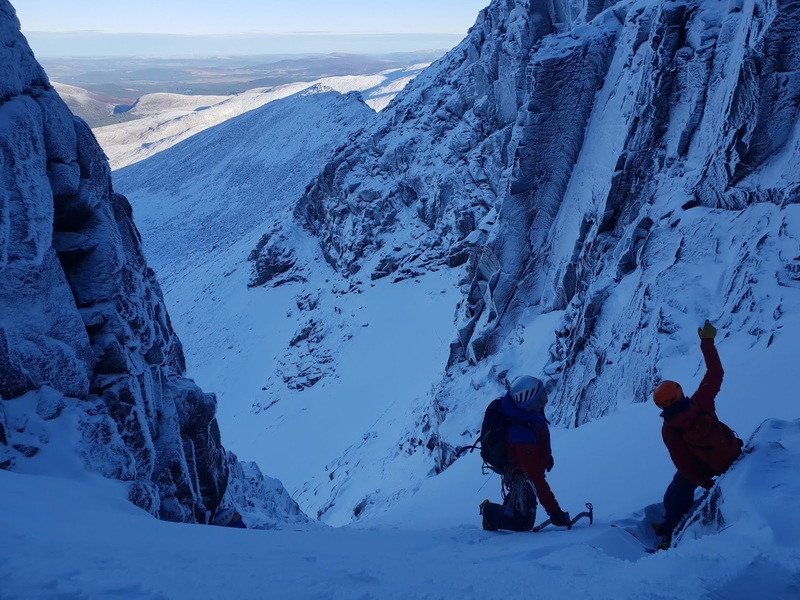 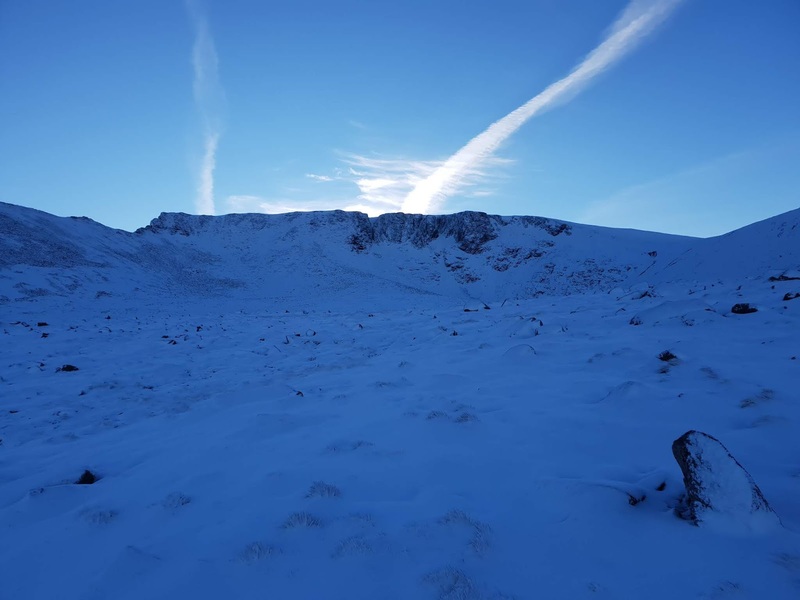 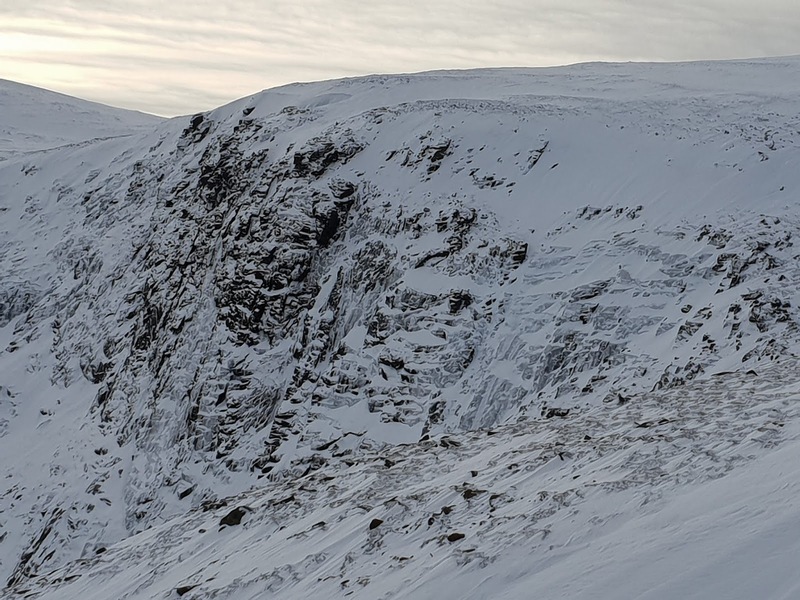 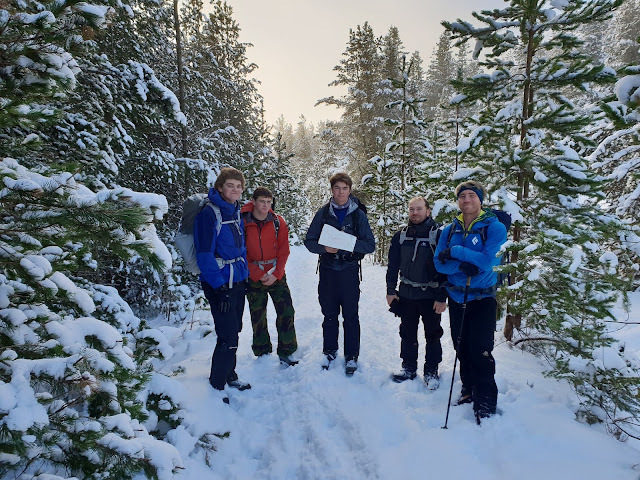 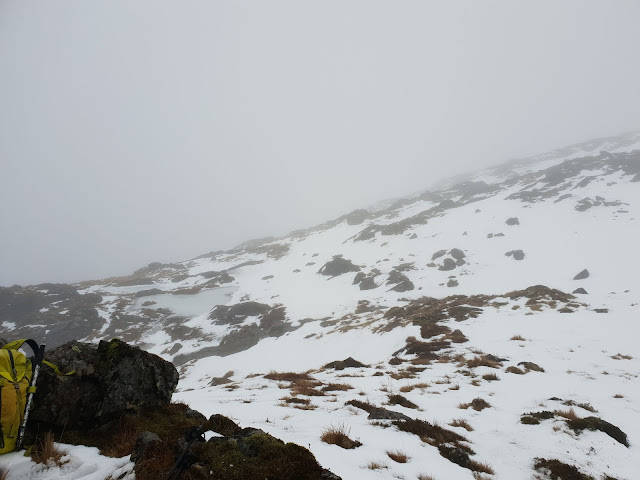 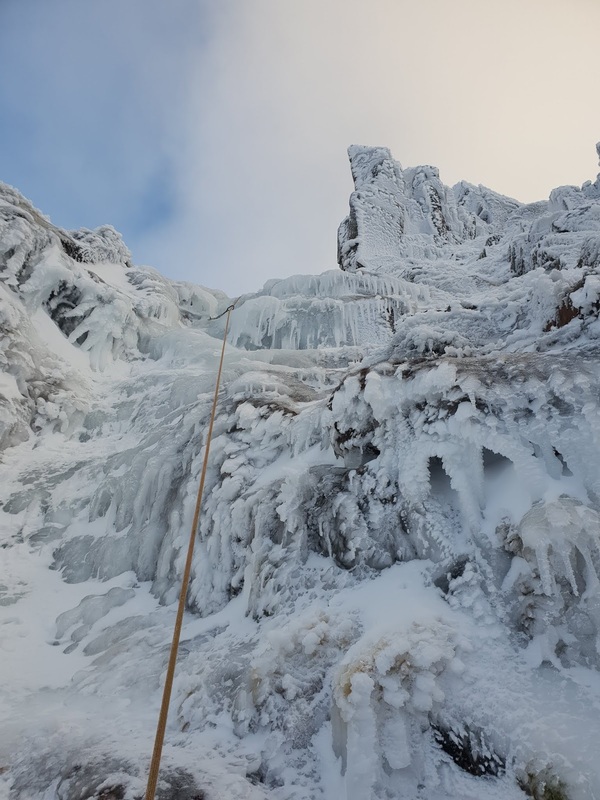 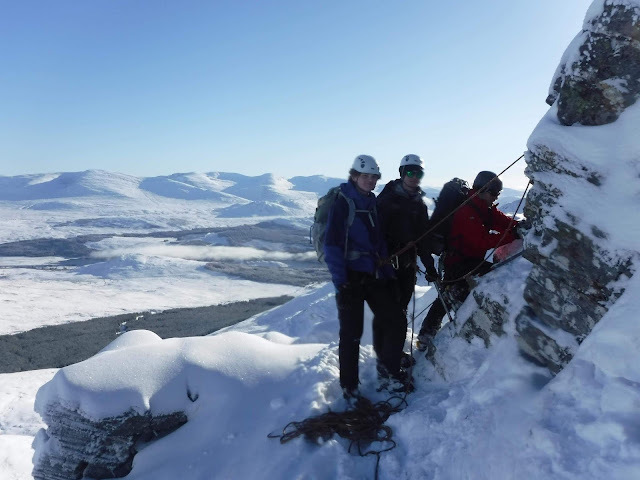 On the second day of the Wet and High Adventures Winter Skills course we headed to Achlean and completed a round of Carn Ban Mor and Sgor Gaoith. 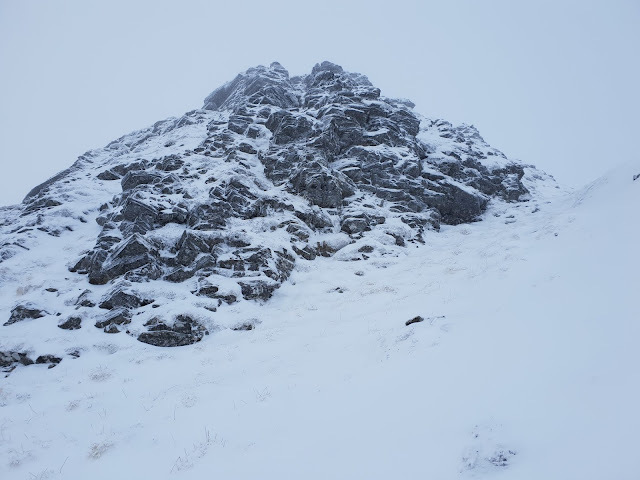 Some limited visibility navigation was required at the top to find the summit (a small platform that juts out into space) before headed back down out of the cloud into the warmer and sunnier low slopes. 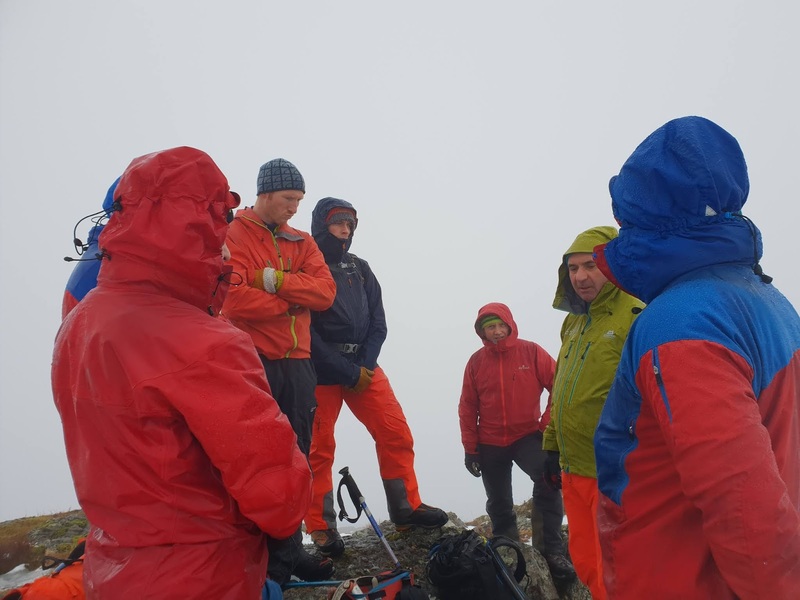 Lot of discussion about safe travel techniques and managing a steady pace for a long day out. I was working for Wet and High Adventures Ltd today in Coire an T'Sneachda with 4 clients on a Winter Skills course. 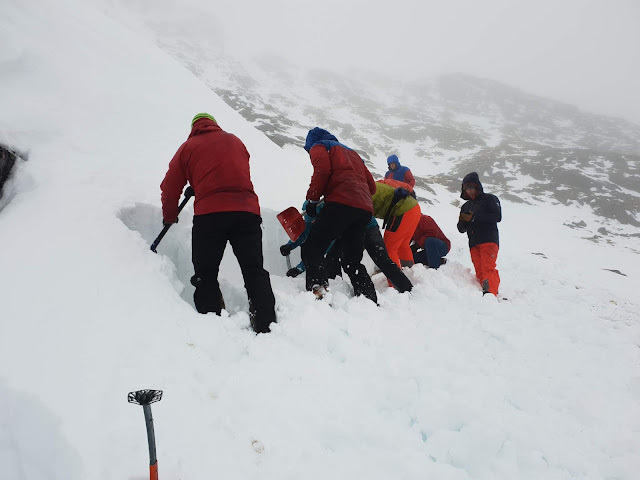 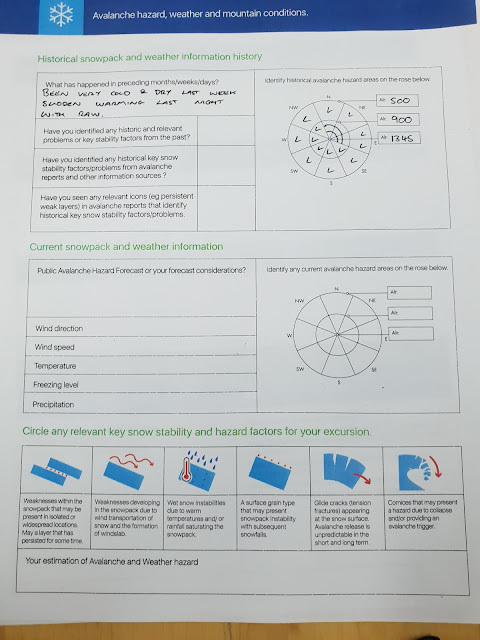 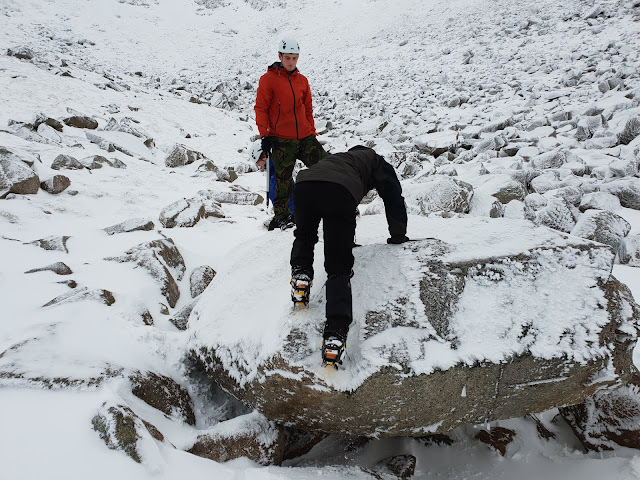 We looked at safe travel techniques and avalanche awareness, using crampons on the flat ice before finding some steep snow to look at secure foot work and use of axe. 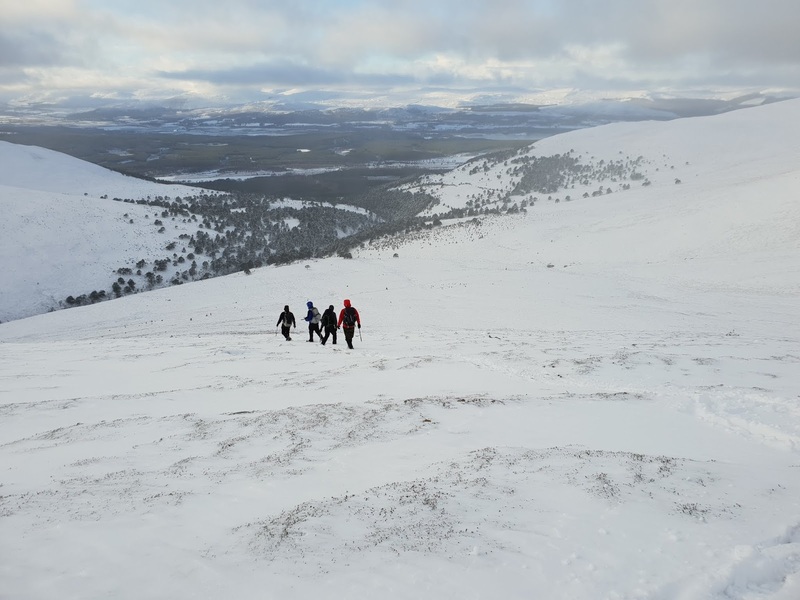 The was even time for a little bit of sliding at the end before walking out in the sun for coffee and cake back in Aviemore. ..... so this is an 8000 word essay. What a day in Coire an T'Sneachda today. 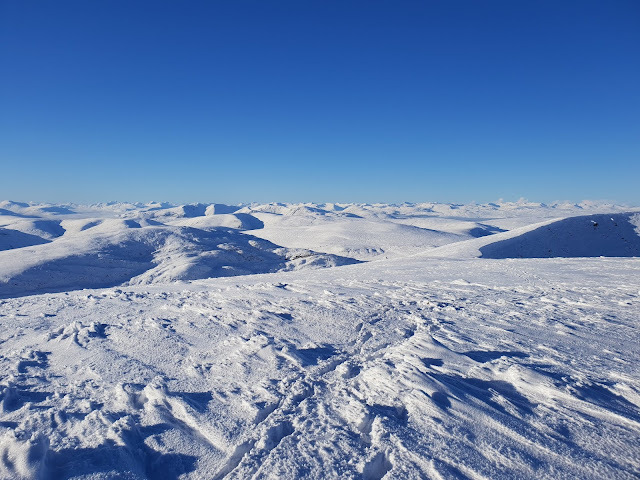 Blue skies and low winds. Mandy and I walked in to have a look see and ended up climbing a very lean Aladdin's Mirror into Central Left hand which was sporting some very nice ice in the final section. 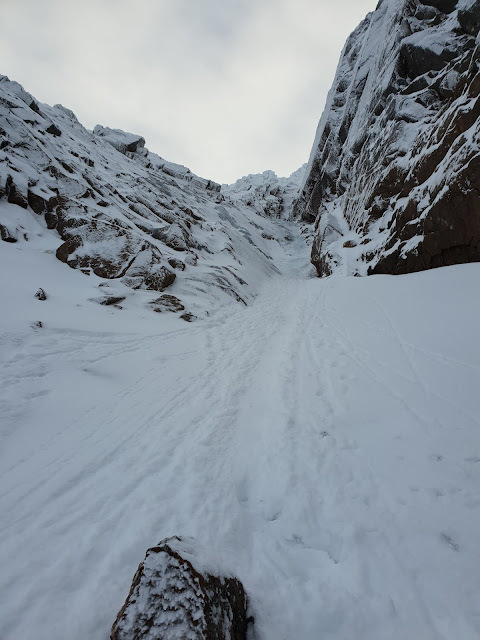 Pygmy Ridge was too much for me today but is something I will be back to do in the future. 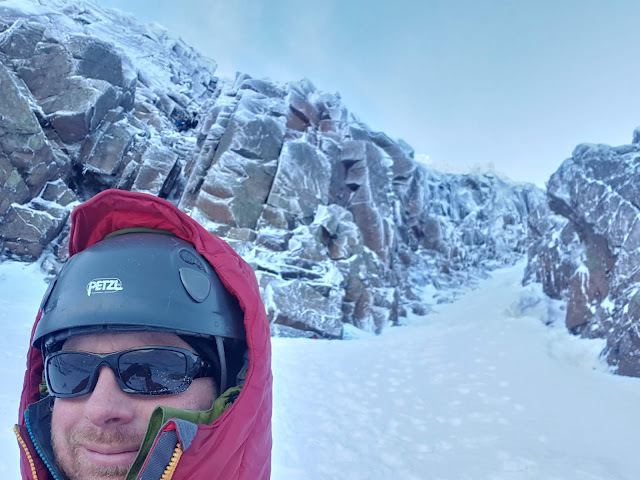 Always good to bump into friends on the hill and we had a nice chat with Swifty as he belayed his clients who were having a great time with him. 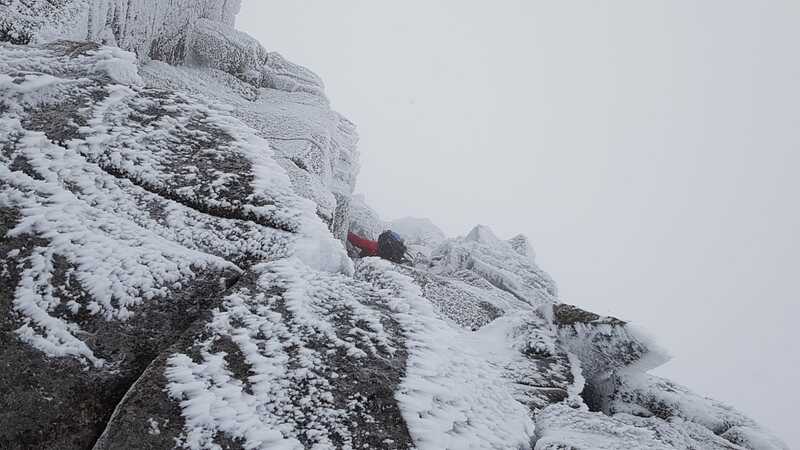 A quick* solo of the East Ridge of Beinn a Chaorainn always gives a good day out. 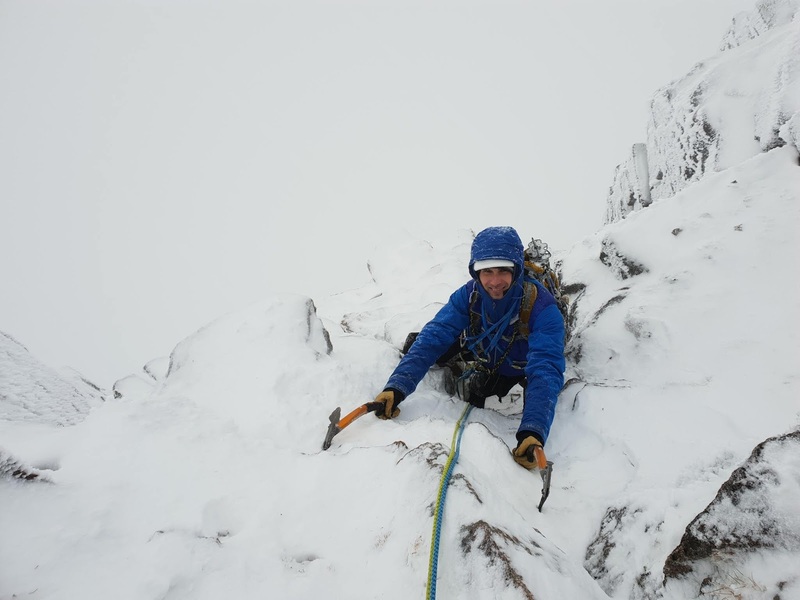 The last time I did this I was on skis and it was much whiter today so I wish I had brought them with me. Big thanks to the teams from Outward Bound (including a friend, Beth) who put a track into the the bottom of the steep part. 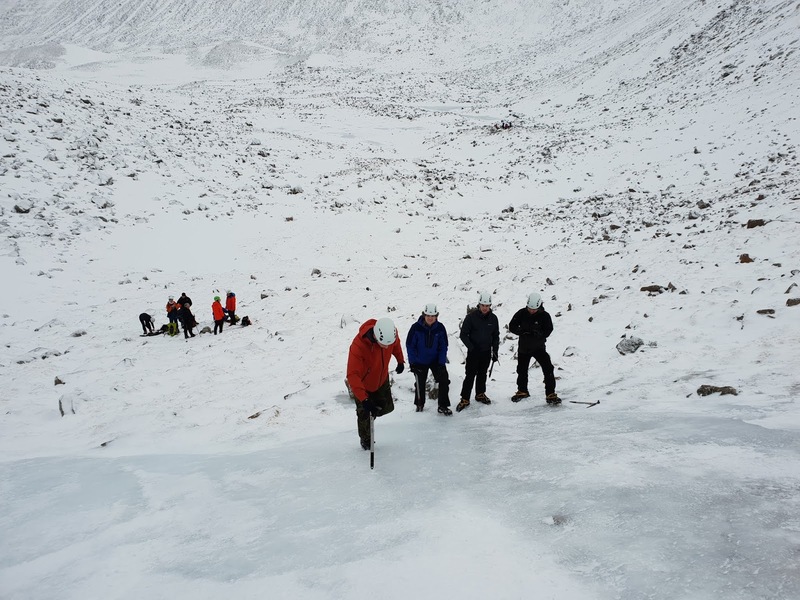 As they were getting the ropes out, I pushed on up, wading through the deep snow until I decided to stop and put my crampons on. 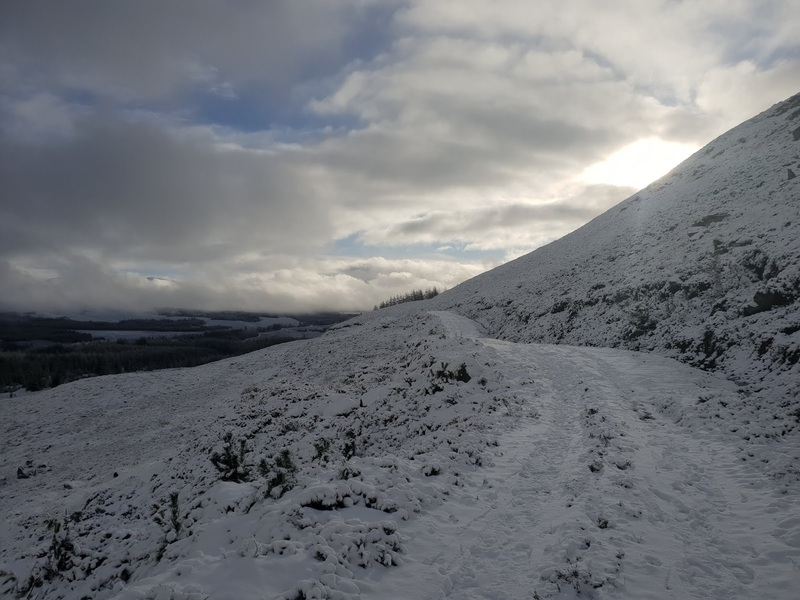 This was timed perfectly as 2 other people caught up as I was "tactically faffing"and they went on ahead ploughing the trail for me. 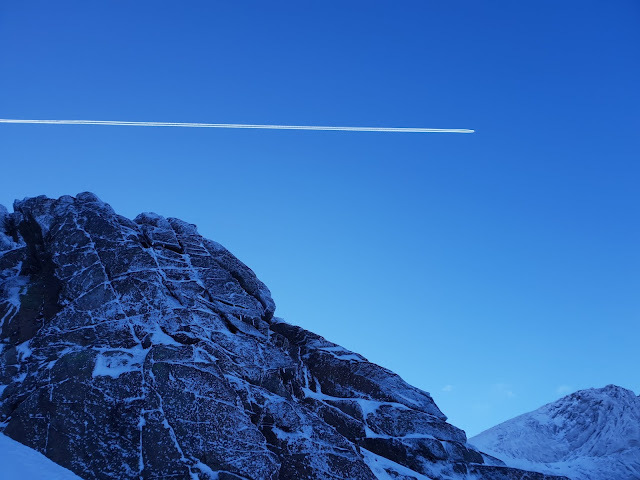 Unfortunately they turned right at the top and I was going left. This meant some more deep wading across the plateau in near whiteout conditions until I dropped down to the tree line and made good time back to the van. 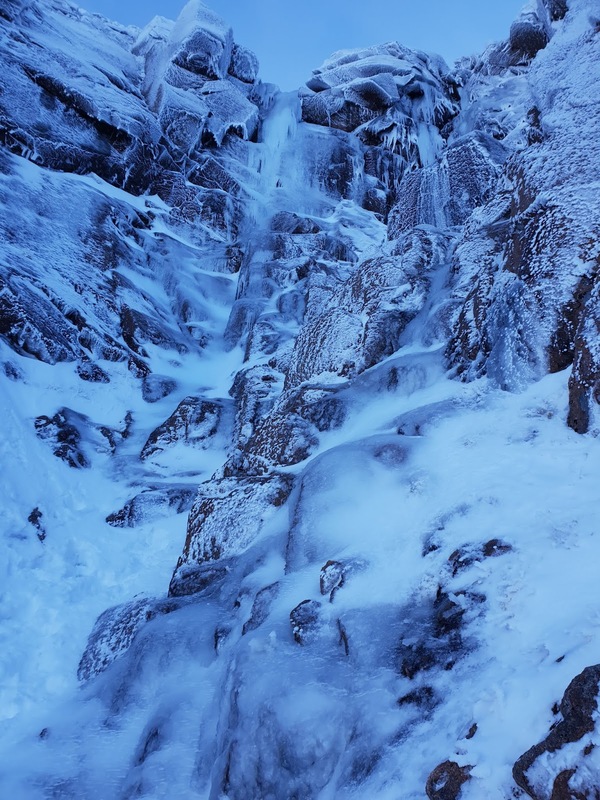 Today Si and I walked into Coire an Lochain with the intention of climbing Sidewinder (III 4). Well, we led a pitch each and got the first two pitches right. 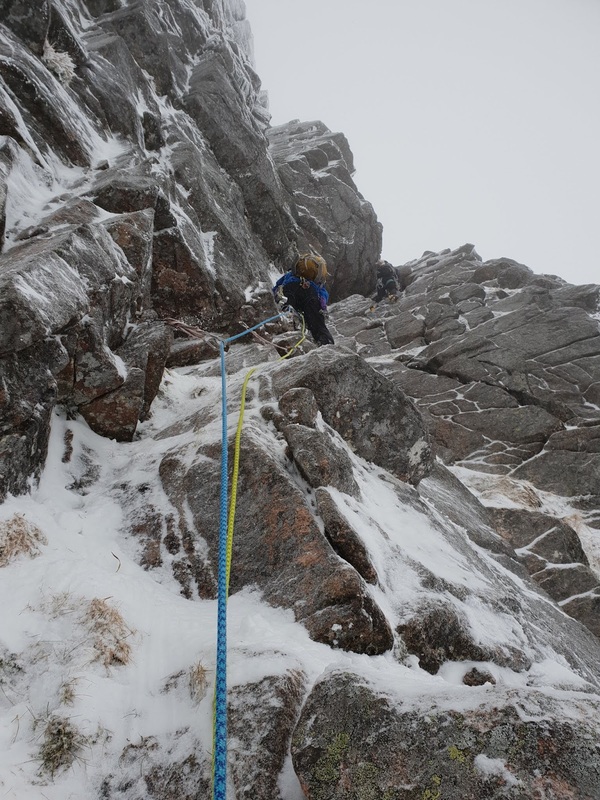 We continued to swing leads as we ended up on harder ground at around IV 5 on the top 2 pitches of Western Route. 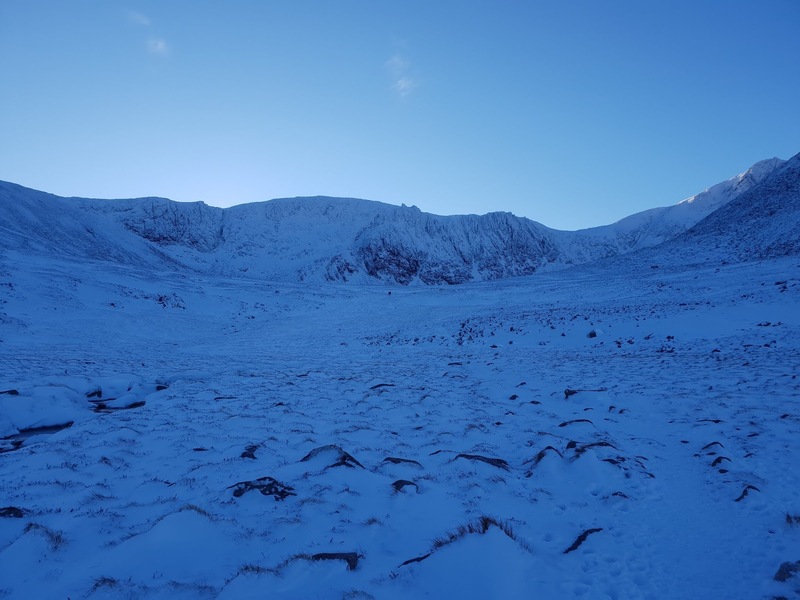 A clear start to the morning saw 3 of us walk into Coire an T' Sneachda to see what as happening. 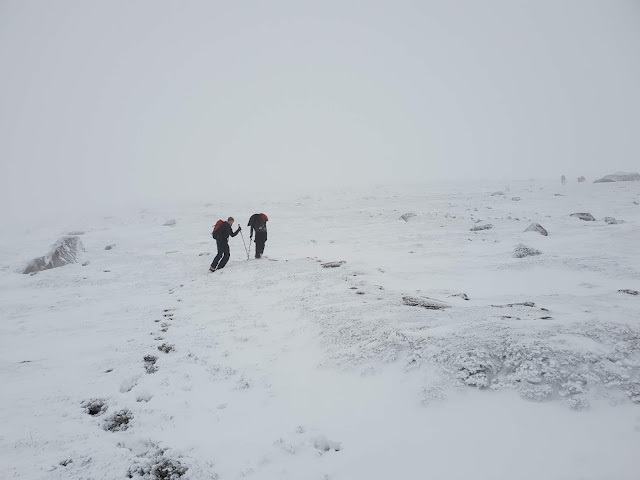 Sadly I had a false start and got turned back by some poor conditions on the start of Terms on Endearment. Today 3 of us took a punt on Creagan Coire Cha-No being good to go and managed to get a route in around III/IV on one of the buttresses. 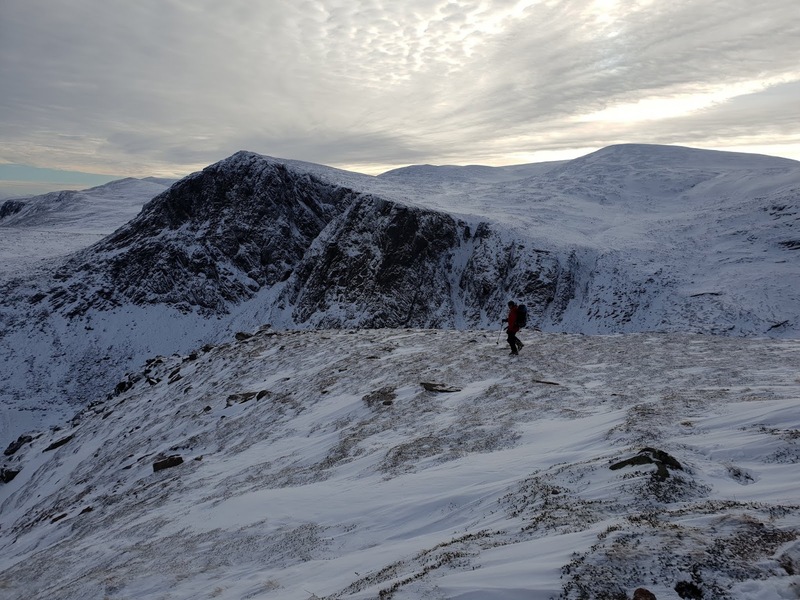 Winter made an appearance today so Stu and I headed into Corrie an Lochain to see what was what. 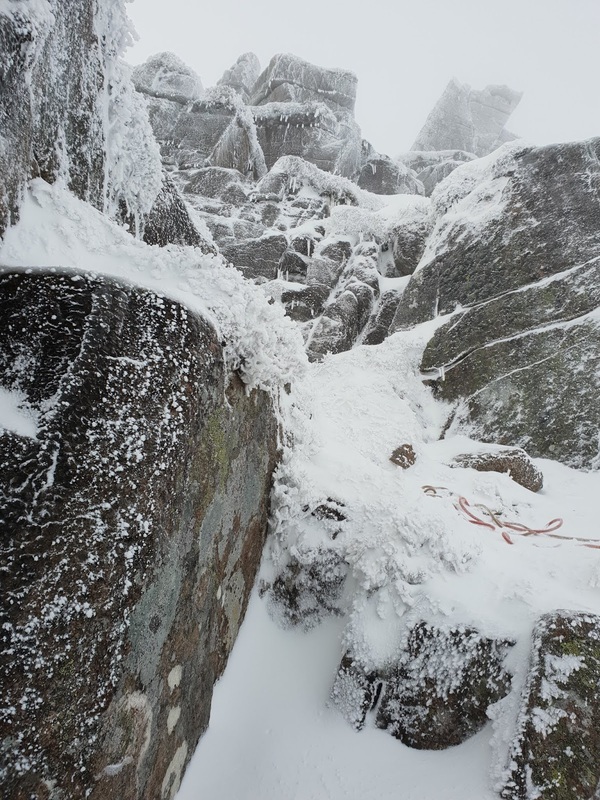 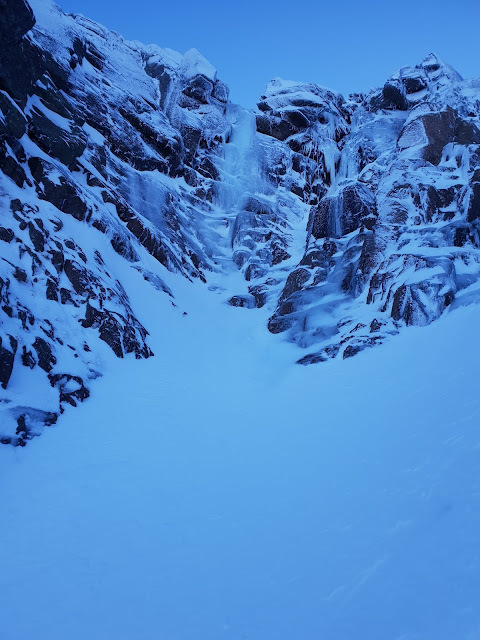 Having sussed The Couloir as an option we joined Jake and Mandy and had a great solo up on consolidated old snow with a then layer of new stuff on top. A super sociable climb with 4 off us chatting away and grabbing the odd respite from calf pain in the wind scoops. 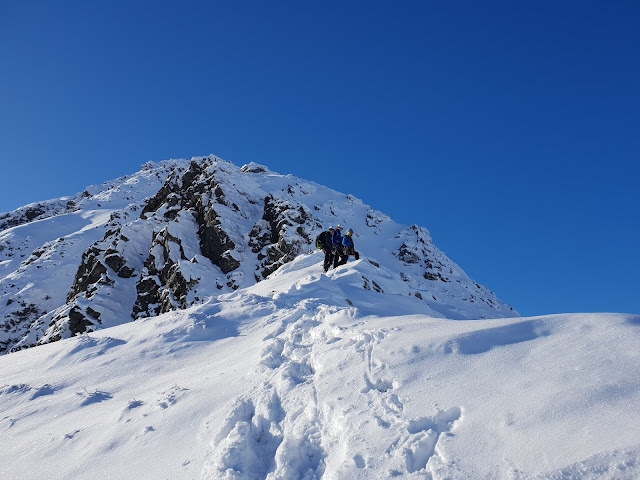 First winter day this year so good to stretch the legs and get back into winter mode.